Erin Harpe has been called “one of the most dynamic, talented and exciting roots rocking blues women on the scene” by Living Blues Magazine. 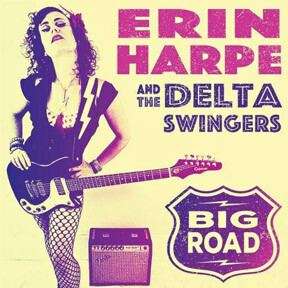 Erin Harpe & the Delta Swingers, her Boston Music Award-winning band, just released their second full-length album entitled “Big Road” - out on VizzTone! The self-produced album highlights Erin’s diverse influences, from her roots in acoustic delta and piedmont blues, to her electric side - slide guitar, boogie blues, funk, and soul. In the time since the band’s debut album “Love Whip Blues” (produced by Dave Gross) Erin and the band have been touring the country nonstop - honing their craft, and making plenty of new fans. They’ve driven countless miles (Erin behind the wheel) and had numerous adventures, and also (as you can imagine) trials, along the way. Subsequently, Erin has emerged into the limelight, taking on a more direct role as producer and playing lead guitar. Big Road is an apt name for her new, self-produced album. It describes where she and the band have been, traveling the highways and back roads, bringing people joy through their music. It’s also the name of Erin’s favorite Tommy Johnson song, “Big Road Blues’” the one that Billy Gibbons said he liked her arrangement of when she opened for ZZ Top! “It’s the album I’ve always wanted to make,” explains Erin, “an authentic live-sounding set of songs, centered around my guitar playing, which is at the root of my music – from acoustic finger-picking, to electric slide guitar, to wah-wah fueled funk, with a few guitar solos thrown in.” The album was recorded (and mixed) in just 6 days by Pete Weiss at Verdant Studio, during a snowstorm in southern Vermont, and features Jim Countryman on bass guitar and ukulele bass, Matt “Charles” Prozialeck on harmonica, and Kendall Divoll on drums and percussion, with a little organ and accordion added by their friend Michael Casavant.